The Lamborghini Aventador – 3D printing made him this fast! Home / 3D Printer News / The Lamborghini Aventador – 3D printing made him this fast! For their newest model the Aventador, Lamborghini used a slightly different approach in their production process. This was a must because the Aventador needed to be lighter and faster than any previous model but still within the budget. In comes 3D printing. With success they made the Aventador 9 percent more powerful, 20 percent more fuel efficient and 6 percent lighter than the previous generation Murciélago. 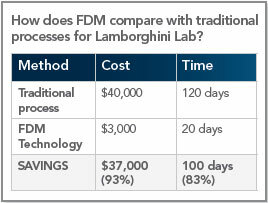 The Lamborghini Lab at the University of Washington partnered with Lamborghini to provide detailed design, quality control, process improvement and mechanical testing. Many physical prototypes were required to validate assembly fit, verify efficient load paths, and identify and correct issues that were invisible on the computer screen. To save costs in this very expensive process they turned to their two Stratasys machines, a Fortus 3D Production System and a Dimension 3D printer. To give you a clear image of what cost reduction this decision brought, check out the next table. If you’re interested in a more thorough explanation of the role of these 3D printers in the making of the Aventador, make sure to read the full story on the Stratasys website.